Item Code: Features:Instant Tea Powder Production Line is consist of: Extraction system Speration system Concentration system Spray Dryer system Heat recovery system Fluid bed granulation system Other system, like packaging system. Our extraction tank are widely applicable for pharmaceutical (CTM), healthy food, instant drinks, and chemical industries. Our special design provides high working efficiency, and convenient operation. WIP (washing in place) section is available on request. With multi-units of extraction tanks in series, we could have the extraction process semi-continuous, and extract most of the ingredients from the raw material. Some special tea requires special design to retain the aroma. We have the design to extract the aroma and separate it for further process. Disc Separator is a kind of purification equipment used in the biotechnology, pharmaceutical, pigment, foodstuff, oil, petrochemical, and dairy industries to separate the mixture of “liquid -- liquid and solid – liquid” in different proportion. There’re very low percentage fibers or ash in the extract. To make sure the final product could be 100% solved, we suggest disc separator to take out the impurities. To make cold water soluble tea, we should also separate the tea oil. It could be one separator to separate the oil and insoluble impurities, or two separators separately. Some customer also requires further separator to refine the tea oil. We normally suggest multi-effects falling film evaporator to concentrate the extract before spray dryer. It saves energy by utilizing the steam repeatedly. The condensing heat can also be recovered, if the vapor from the front effect is compressed to higher pressure. The saturated steam temperature corresponding to the pressure is also higher and the vapor can be reused for heating. Steam jet vapor compressor is used under this principle. The jet compressor is operated at a very high velocity and has no movable parts. The structure is simple and the operation reliable. Every effect of falling-film evaporator has an upper distribution system. The liquid flows downwards in each tube uniformly, forming a cylindrical hollow thin liquid layer, the vapors flow axially downwards. The concentrated product is separated from the vapors in two steps, firstly to the lower end by gravity, and secondly by a high efficient cyclone separator. The clean vapors are then used to heat the next effect, or condensed (last effect). There also freezing concentrators. But the powder consumption is very high, so the application is not wide. To have good solubility, we normally suggest pressure spray dryer for this application. The concentrated solution should be fed into the drying tower by high pressure homogenizing pump, and then sprayed into fine beads. Filtered and heated air flows into the drying tower through hot air distributors, and will dry the liquid fine beads very fast. The dry product will be collected at the bottom of the spray dryer, and fines to be collected in the cyclones. Our special design will guarantee the quality of the product and reduce the energy consumption. The brew tea leaves might be used as the fuel of the system. But the original brew tea leaves are wet, not easy to be combusted. So we press the tea leaves first, and then utilize the hot air from the drying tower and the heat of flue gas to dry the tea leaves before feed them to hot air furnace or boiler. To have the plant run smoothly, we also configure some sedimentation tanks, buffer tanks, and other storage tanks for the system. WIP (Washing In Place) system is provided on request. When bigger product particle size is required, we suggest fluid bed granulator which could produce particles of around 1 to 2 mm. In the granulator, fine instant tea powder is loaded in a product container, and fluidized by heated and filtered air. 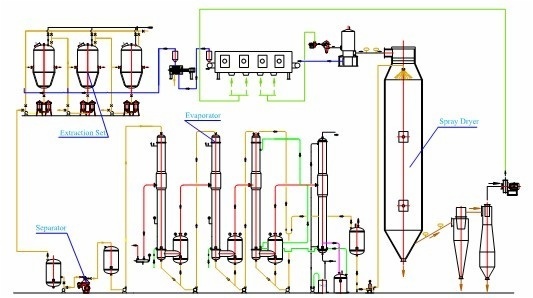 Liquid tea extract or any other flavor are sprayed onto the fluidized power to make granules.